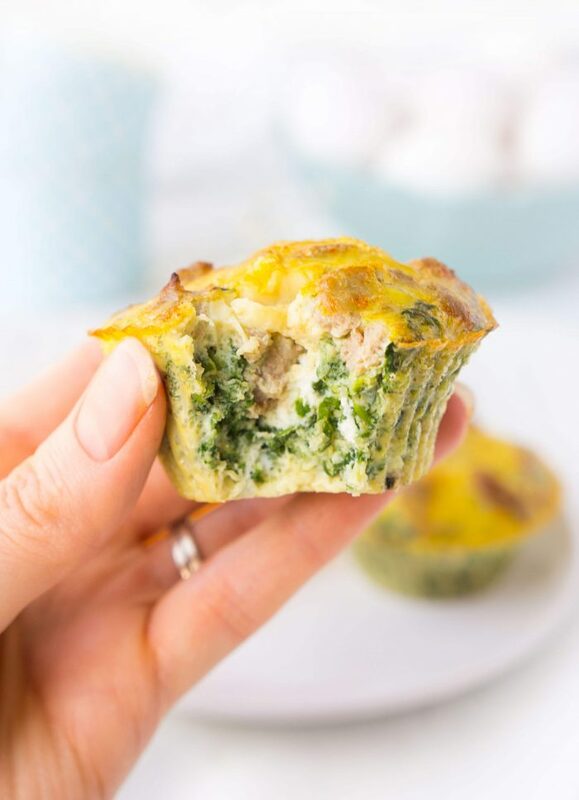 My latest go-to recipe that meets this criteria are these Turkey Sausage Spinach Muffins. 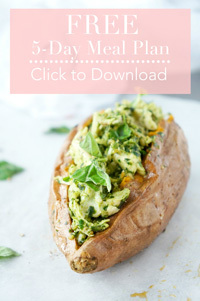 They are packed with protein, filled with vitamins-A, K, C and potassium-rich spinach and you get a taste of delicious turkey sausage in each bite. It’s basically like the most amazing breakfast ever in a cup. 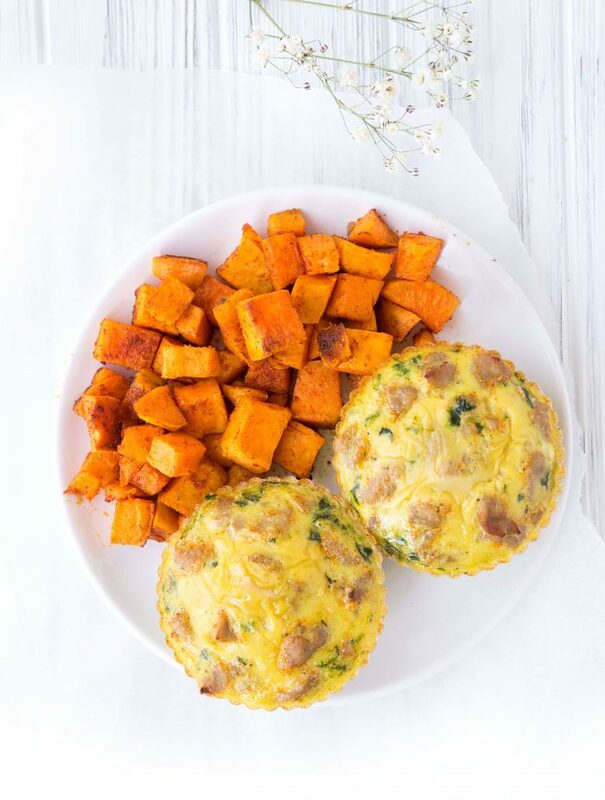 Perfect for those mornings where you need an easy no-fuss breakfast that will fill you up for hours. First, you’ll want to go ahead and preheat the oven to 375 degrees F.
Next, you’ll need to get out twelve turkey breakfast sausages and remove the casing. I usually just like to squeeze the sausage out of the casing right into a frying pan. That’s the easiest mess-free option . 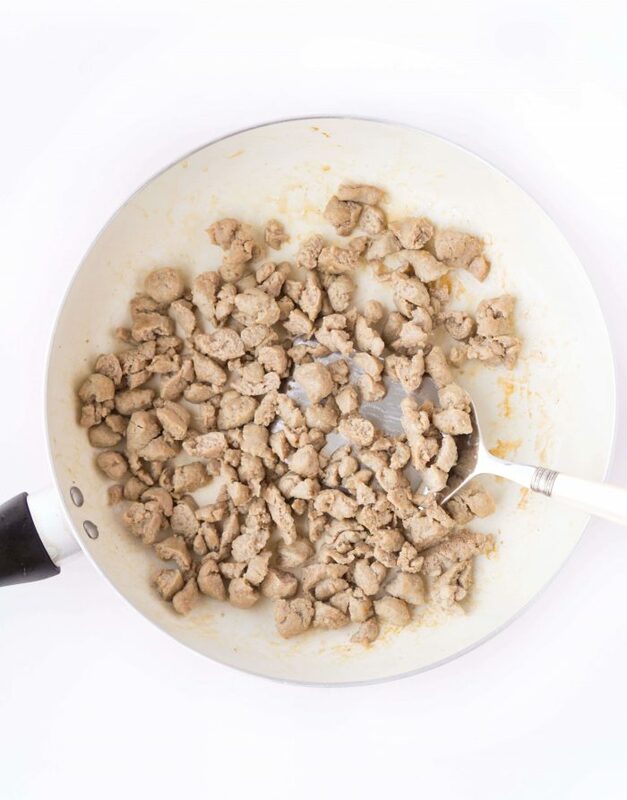 Once all of the casing is removed, cook up the sausage in a frying pan over medium-high heat for about 5 minutes or until lightly browned, breaking it up with a spoon until it forms into bite-sized chunks. Next, mix up the eggs, egg whites, spices, hot sauce and spinach in a medium-sized bowl until combined. 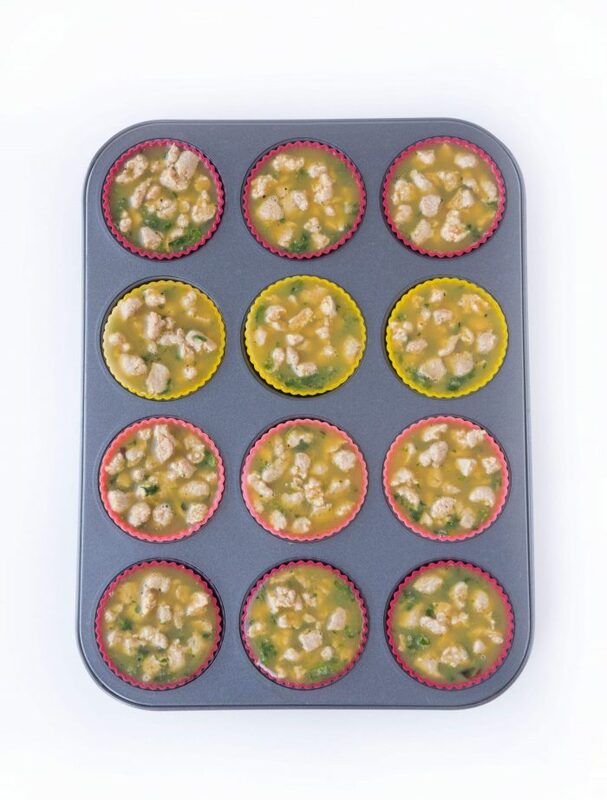 Grease a muffin tin or use twelve silicone baking cups (HIGHLY recommended). Divide the egg mixture among twelve muffin cups. Next, equally divide the turkey sausage among the egg mixture in the twelve cups. You may wish to press it down slightly so that some of the sausage makes its way to the bottom of the egg mixture in each cup. We want a bit of that sausage in each bite! Place in the oven and bake for 30-35 minutes or until eggs are cooked through and no longer runny. The end result will be twelve delicious and protein-packed cups. 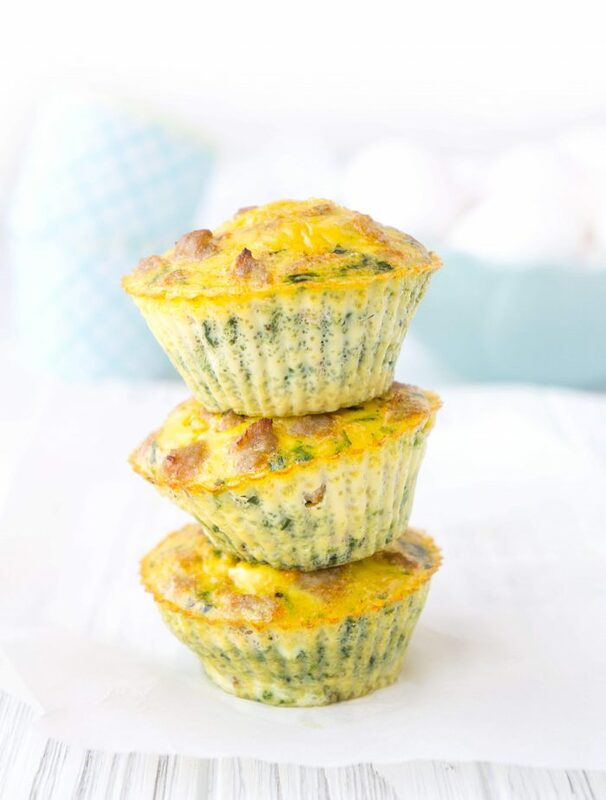 When making these egg muffins, I discovered a few tips that will make your life SO MUCH easier. We could all use a little help in that department, right?! One of the food items that I always LOVE to have on hand are frozen spinach nuggets. The spinach is already chopped up finely and cooked so you simply have to defrost them and add them to your desired recipe (I also use the spinach nuggets for these Roasted Garlic & Feta Chicken Burgers). You can defrost them by leaving them in a bowl in the fridge overnight or popping them into the microwave for a couple of minutes. Squeeze some of the excess water out of them and add the spinach to the bowl. So easy! Another helpful tip I learned when testing this recipe is to use silicone baking cups. It helps prevent sticking so you can basically just pop the egg muffins out of the cups when they’re done baking. 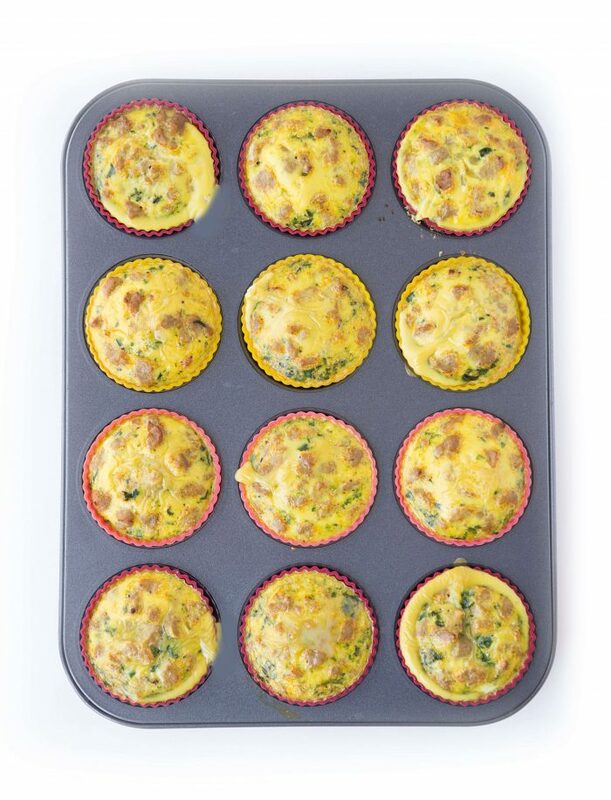 Say buh-bye to scraping crusted egg bits off the muffin tin for HOURS. And I say this from personal experience. There are SO many other things you could be doing with your time! Do yourself a favour and get some of these silicone baking cups. I use them for so many recipes! 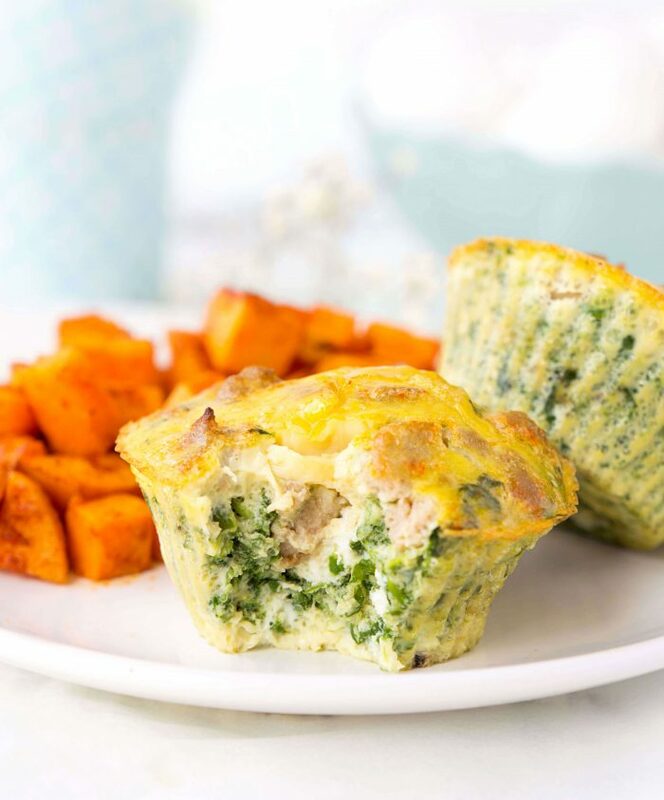 Once cooked and cooled, you can store these egg muffins in an air-tight container in the fridge for up to four days. Now you might be wondering if you can freeze these muffins. Personally, I freeze them and don’t have an issue with them. Maybe it’s because my crazy mom brain is thinking about 50 million other things. 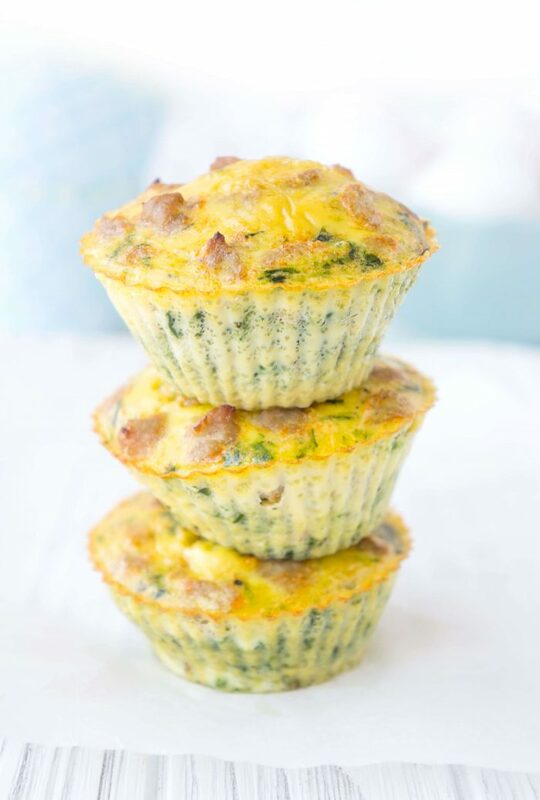 However, some people claim that egg muffins don’t freeze well and don’t taste that awesome when thawed out. It’s really a personal preference. If your whole family is eating them, you’ll probably have no problem downing them in four days, so no freezer will be required! As much as these probably seem like a breakfast food, lately we’ve been actually having them for dinner and lunch too. Sometimes I just crave breakfast for dinner and eggs are one of those foods I can eat at any meal. Here are some ideas for ways you can serve them up! Along with a side of sweet potato hash browns. Simply bake some cubed sweet potato with a drizzle of olive oil and desired spices (I like paprika and garlic powder) for about 30-35 minutes. You can do it at the same time that the egg muffins are cooking! Served on a whole-grain english muffin. Breakfast sandwich, anyone? Served crumbled up in a whole-grain wrap. Breakfast wrap, anyone? Either way, they’re super delicious and are a great way to get in that serving of satisfying protein at meal times! Remove the casing from the turkey sausages. Once the casing has been removed, cook up the sausage in a frying pan over medium-high heat for about 5 minutes or until lightly browned, breaking it up with a spoon until it turns into bite-sized chunks. Next, mix up the eggs, egg whites, spinach, onion powder, hot sauce and salt and pepper in a medium-sized bowl until combined. Next, equally divide the turkey sausage among the egg mixture in the twelve cups. You may wish to press it down slightly so that some of the sausage makes it's way to the bottom of the egg mixture in each cups. 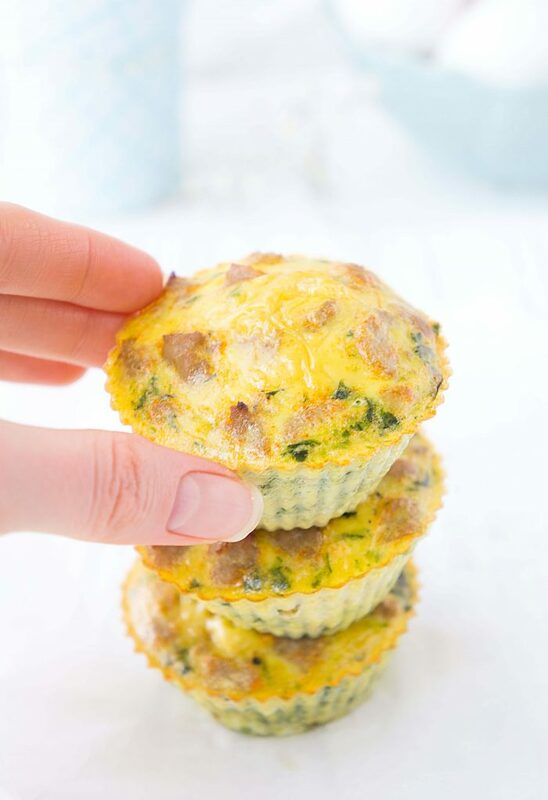 If you have a chance to make these Turkey Sausage Spinach Egg Muffins, I’d love to see them! Tag me on instagram @hauteandhealthyliving and use the hashtag #hauteandhealthy!